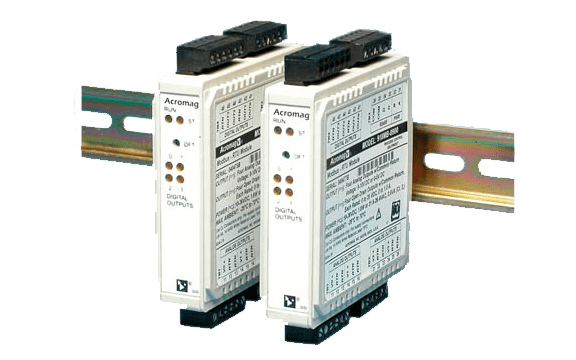 This 913MB/914MB is a signal conditioner supporting the Modbus RTU protocol and equipped with four-channel analog input module and four discrete outputs. Designed to provide isolation between input, output, power, and network circuits. – 0.005% or 1 part in 20,000. – Range user-configured. Range selected applies to all channels. – 0 to 11.17mA (for use with 5020-350 AC sensor). – 0 to 35V DC. – External voltage source required. – 0 to 1A DC continuous for each output. – LEDs indicate power, status, and discrete level/alarm. – 10 to 36V DC or 22 to 26V AC. – 4-way isolation between input, network, power, anddiscrete I/O circuits. Inputs are isolated channel-tochannel for common mode voltage to ±4V DC. AC current sensor for 913MB. One for each channel. Optional terminal block kit, barrier strip style, 4 pcs. Optional terminal block kit, spring clamp style, 4 pcs.